How to Transform a Boring Office Into a Flexible Workspace #Infographic ~ Visualistan '+g+"
Employers tend to take their workforce for granted instead of taking care of them. You may not be aware that you’re putting your employees’ productivity and quality of work at risk by not addressing their needs. It may not seem like a lot, but something as simple as giving employees the right place to work is one of the ways you can boost your company’s success. And it shouldn’t be just any space but a flexible workspace where they can think creatively, focus on the work at hand better, and collaborate with their peers is the right place for them to be. 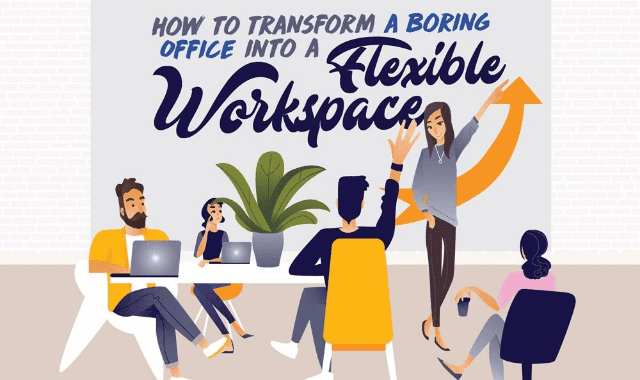 The following infographic courtesy of Figari Group, looks at how to transform a boring office into a flexible work-space.